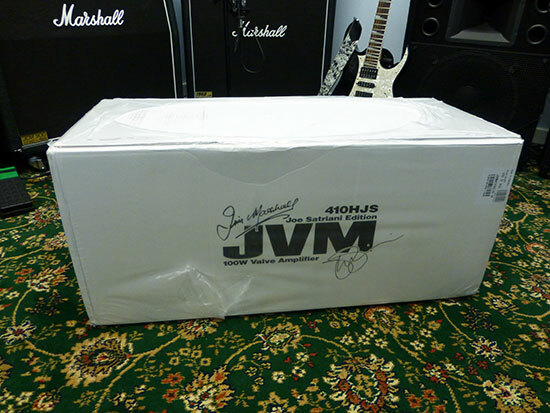 Marshall partnered with Joe Satriani and the result is the JVM410HJS Signature amplifier. But is this amp the best Marshall money can buy? 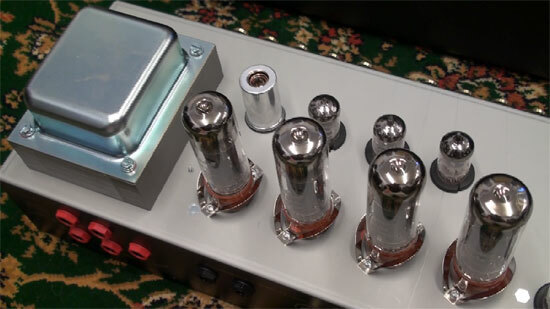 and what about this re-voiced tube amps tones? It's going to be a long review of this Joe Satriani take on the Marshall JVM410HJS signature amp - and don't forget to compare this review directly with our older JVM410H Head review on this site. This review is dedicated to Jim Marshall RIP. When the original JVM came out I was first in the queue to get one. The amp promised such a lot for relatively low cost for a REAL tube amplifier from Marshall Amps based in Milton Keynes in the United Kingdom. It's nice to see that Marshall continues to innovate (as they always have done) over the years and this new Satch JVM410HJS is currently going to be the latest pinnacle of what they offer to ordinary guys in the street worldwide. 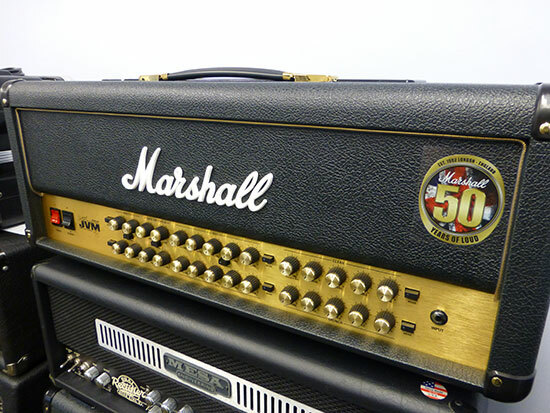 Marshall of recent times (lets say the last five or six years or so but probably much longer) have developed a 'Signature' series of amplifiers that reflect the players amps of the kings of guitarists including Jimi Hendrix, Slash, Yngwie Malmsteen, many more axe wielders and now one at the top of the tree Joe Satriani. The funny thing is, that Joe was not a user of this amp and often over more recent times used a competitors amp (Peavey JSX). Nonetheless, it seems that Joe did not continue with that partner for one reason or another (he says his amps were 'not up to it' (whatever that means) and now courts Marshall Amplification in the search for the perfect tone. Just how 'great' the Marshall JVM410HJS Satriani Model will be remains to be seen, and lower down in this review we're going to do the 'Inside and Out' full review that I am well known for. Hopefully I can cajole some insight from Santiago Alvarez (but not guaranteed because I don't pay his salary) as we proceed just to give a manufacturer and designers point of view to the proceedings and review. That would be a really great insight. Remember that Marshall and SA know basically all there is to know about the Joe Satriani aspect of this amplifier. I was really looking forward to this review at the time and maybe, just maybe, Marshall and Joe have turned this behemoth of an amp in to something it might have been in the original version. If you have checked out my original review of the JVM you will know I was not a fan of that amp for many reasons but there are a number of changes to the Satch version which I'm sure will address some of those earlier issues I had at the time... let's hope so. Where do we start with an amp like this? Well, we can start by lugging in this amplifier in its box to where we open it up (literally in this case). The box with its amp inside believe it or not is a whopping 26.5 kilos! That's about 55 Lbs. to me and many others (I really HATE that metric crap). But to be fair, it IS in the box, with the floor pedal and other bits n pieces so the amp will actually be lighter. In any case, after getting the thing out of its shipping carton things looked nicer - and very familiar. For a moment there I thought it was one of those original JVM410H heads that I have had two of historically (hoping) to get a great lead guitar sound from but never actually did. Its not that the original JVM was a bad amp, in fact it was very useable in many ways, indeed very versatile, but those squealing lead channels were awful (more on that later). What other amps should we compare this JS amp to? That's a good question, and while there are lots of amps out there, there are not really that many that are as versatile as this Satch amp. Personally I immediately think of a Mesa Boogie Road King.. (although to be honest the RK is even more versatile than this JVM410HJS). Then there's obviously the original JVM... and that amp is far cheaper than this one. Personally I also like the YJM100 which I think has a nicer sound than this amp, but suffers in versatility in comparison (and it costs more money). You could search for other brands and come up with your own comparisons but do read this review first... then go and buy one... that's why I write these reviews... so you have a slightly more informed choice than simply buying something that might well not be for you. I went along to my friendly local guitar shop (Academy of Sound in Stoke on Trent England) and ordered this amp some time ago. In fact it feels like years ago but was just a few months really. This Joe Satriani amp from Marshall had been rumored for a long time and there was plenty of footage around on the net showing Joe indeed playing through what looked like a JVM410H. But of course not as we know it. Joe had set out to change the world on the JVM410H (and indeed he needed to) and with the help of Santiago Alvarez (designer at Marshall) he did. This redesigned amp (we'll talk about that later) sells in the UK for £1395.00 or around $2600 at Sweetwater when I checked at review time. That's the bog standard edition! But there's also a limited edition too with 'blue/purple vinyl' and a 4x12 cab (you get one for the money) and the cab claims different speakers. Maybe they are but my 1960a cab worked very nicely indeed on this amp. The Limited edition costs £2199.00 in the UK and from what I see it might or might not be available in the USA - at least I can't find a single USA site with it for sale on. And I could only guess at the hugely inflated prices they would ask. I did see one of these recently with cab brand new 'clearance (in July 2015) for the princely sum of £1400 (or $2100) which is a bargain. There are (I believe) only 500 pieces of this amp to be made... now its not clear if that is 500 of the head (the standard one) or just the limited edition. I think the limited edition one will be the 500 piece amp/cab, while the regular amp under review here will be general release. Note that apart from the vinyl and the cab, the amp circuitry is exactly the same as the standard amp so don't go and buy one because you think it will sound 'better' than the regular one under review - and IS the same, it will sound the same, especially if you use a 1960a cab as I did. Maybe that Joe cab is really THAT different... but I doubt it. Nevertheless if you have loads of money then like the blue/purple vinyl and need a cab... and collect amps then the LE is the one to buy. Just like the YJM, the AFD and the JVM this chassis is 1.6mm steel with a coating to stop rust. Marshall chassis are as solid as you get really and made in house, I guess it might add a little weight, but there's no bettering the chassis build on the Joe Satriani head from almost any company. 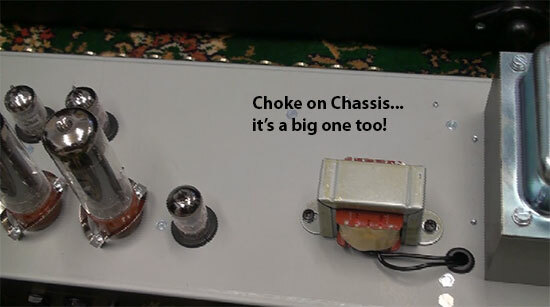 I have seen some awful chassis over time even on effects or one particular guitar amp simulators. The one I distinctly remember was corners on a rack unit that had just one tack weld to hold it all together. You won't find that sort of thing on this amp or indeed any Marshall amp from Milton Keynes and that's a fact. But then again, Marshall know what they are doing... right? The case had its back plate fitted with decent set screws that had inserts in the wood so no wear takes place if you remove the head back plate a lot (more on that later). You must be Choking? Right? 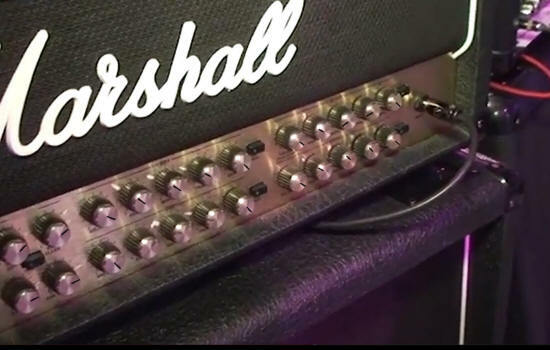 You know, on that original JVM head from Marshall (actually those TWO I had) there was no 'choke' fitted to the amp like many of the classic Marshall older amps had. I did query this with Santiago Alvarez when I wrote the original review of the JVM410H, and Santiago said because of the style that the JVM410H was designed for that it did not need a choke. Well he should know! But there were many subsequent 'modifications' for the original amp by owners all over the internet. Guess what? The JVM410HJS Satch amp has a choke! Now listen up, it either needs a 'choke' or it does not... right? Now many people feel that the 'choke' is part of the overall sound and feel of how an amp plays and indeed I do think it makes a difference but from my experience on the older amp not a lot. You may disagree. But there's more to this 'choke' thing than meets the eye as we shall see in the next section of this review. Output Transformer: TXOP 00029. This is exactly the same transformer as fitted to the original JVM and made by Dagnall here in the UK. Input Transformer: TXMA 000121. Once again this is exactly the same power transformer as fitted to the JVM original amp made by Dagnall. Well on this occasion I think that the whole board layout is quite different to the old one. Now listen up, if the board schematics are the same (maybe or not but let's assume they are) and the layout of the PCB is as different as this one is to the older board from the original JVM then that CAN have a bearing on the amps overall tone. Why, on some of those much older amps (like JTM or JMP) even where you run the wires in the chassis affected the tone! Mesa Boogie's Randall Smith even goes so far as to 'round the corners' on the tracks on his PCB's and manually draws them so that tone is least affected. Let's look a little further. For example, the Bias is now at the other end of the board compared to the original JVM layout. The back of this board now utilises a daughter board for all the outputs on the back of the amp... the original had no such board on the amps I reviewed JVM-401-H-HERE. And of course if you compare the two boards by checking out both reviews on this site you will see massive changes. But remember, Joe and Marshall said there were a few 'tweaks'... really? My own view (right or wrong) is that while the original JVM410H was a reasonably cool amp, that feedback on OD1 and OD2 was not good. The fix? oops we have to redesign a few bits and layout the board in a different way was part of that 'fix' for some of that. Of course there is far more to it than my simplistic view I'm sure, as Santiago Alvarez might tell you. Back Outboard Daughter Board: This new addition nicely removes from the main PBC all the I/O connectors and those are connected as necessary to the main board with fliers. Much nicer to see because if you do get any trouble with this then its a simple daughterboard removal rather than the whole main board. Its also nicer because if you had major issues then you replace the daughter board and not the main board. Nice. But it does add to the amps production cost - remember that. Front Control PCB's: There are around three PCB's that hold all the front knobs and these are mounted vertically with the very same pots of the newer amps... those surface mounted green things. Not so good if you do get a problem when you're on the road but they do seem to be pretty much problem free now. In the case of a Mesa Boogie, you would simply fit another. In this case, you might obtain a PCB and change it. Other than the above this JVM410HJS looks pretty standard. I did notice a 'chip' on the input connector for the guitar... not sure what that is, but maybe it is one of those little preamp type things... maybe not. They don't talk much about the insides do they! I also didn't like the STANDBY SWITCH which looked pretty standard for one of these style of amps, but mine was not too cool. When it was 'off' the switch centre flopped around basically almost as if it was a faulty switch (the power switch was perfect) and made this unit feel 'cheap'. In reality it does work, but honestly, I really think this one could be dodgy. Check yours before you buy it! Once again in this new JVM410HJS Satriani head you have to completely remove the chassis to carry out 'biasing of the amp' when you change the power tubes. What's a little strange is that while the AFD, the YJM and even the TSL had alternatives to removing the chassis for a re-bias, this amp keeps that awful feature. Honestly, this biasing is a pain when you have to remove the chassis for such a simple adjustment. I guess we have now missed the window for that to be addressed. Never mind; now where's my screwdriver. Other manufacturers also have many fixes for the 'bias' adjustment and it seemed a little short sighted that this aspect was not addressed with this 'tweaking' going on. But then again that might have involved work to the chassis, rear plates etc which would have increased the costs further. Never mind - it was this way for a long time and you only really do it if you change the POWER tubes - preamp tubes don't get biased. Basically these remain (as choices) pretty much the same as on the original amp. Suffice to say that they sound very different than the old JVM we have all seen. Check below for the channel choices). Don't forget that there's a switch on the amp for a 'mid' cut or boost (depending on how you see it) that can dramatically change the tone and feel of OD1 and OD2. 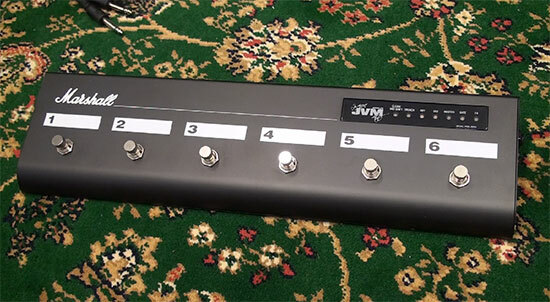 Marshall say (as indeed Joe does) that he wanted this switch so that he could place the amps tone better in two basic different bands/styles i.e. with a vocalist (as in Chicken foot) or as an instrumental soloist as he is better known. I saw these settings being used by Joe on one of the prototypes. Note there is no switch for mid cut/boost so please don't tell me - I already know. But these were the settings that Joe was using at that time live with three amps in total. So I dialed them in... and quickly understood why he needed the noise gates. Strangely enough, those settings did not unfortunately turn me in to a Joe Satriani! They won't do that for you either I'm afraid so don't waste your money if you think this amp will change you for the better. The only thing that will do that guaranteed is to practice and practice some more. Then, maybe, but likely not. The other thing this amp does nicely is to remove £1395.00 (or $2600.00) from your bank account. To be honest most of this is similar to the original JVM so its been copied here with mods to show the differences. red) appearing in the respective MODE switch; the preamplifier’s gain structure is uniquely reconfigured for each and every mode (but not necessarily channel - OD1 & 2 are basically the same channel - which is different than the original amp so you have effectively 9 modes and not really 12 as in the old amp). CLEAN GREEN MODE: This is the cleanest of the three modes and replicates the clean channel on the 6100 anniversary amp from some time ago. Joe likes this pristine clean and that's what you get - unless you move to the amber or red modes. itself into a pseudo high gain channel. In keeping with the classic clean amps of yesteryear, all three modes of this channel feature what is known as a pre-gain tone stack (i.e. the tone network lies before the channel's main gain stage). The reverse (i.e. the tone network being after the main gain stage) is typical of most Marshalls and, as a result, the Clean channel's tone controls work in a slightly different way than you might expect. In addition to controlling the tone of the channel they also affect how it reacts in terms of gain, allowing you to shape how the signal distorts. distorted. This is because the signal is being distorted after the tone stage, minimizing the effectiveness of the Bass, Middle and Treble controls. At this point the JVM reverts to the more typical Marshall preamp circuit characteristic of ‘gain then tone’. This is also true of the OD1 and OD2 channels. CRUNCH-GREEN-MODE: This mode is inspired by a Master Volume, JMP - it shares the preamp topology of the classic Marshall JTM45/1959 ‘Plexi’ models (i.e. : gain + gain + tone). CRUNCH-ORANGE-MODE: This mode is reminiscent of the Marshall JCM800 2203 amplifier, a staple of hard rock. The gain structure is gain + gain + gain + tone. CRUNCH-RED-MODE: this shares the topology of the Orange mode but with more gain, giving you sounds similar to a hot-rodded JCM800. Joe used this channel to record two albums - a solo album AND a Chicken foot album as well as touring. You could say that Joe likes this channel mode! These two channels (and modes) are now completely different than the original JVM410H. There is absolutely no doubt in my mind that these channels now make this amplifier a very useable device which you really can get those tones from. Joe has suggested that these are the 'same' as the original OD1 channel. I really think there's more to it than that. The OD1 & OD2 on this JS amp eat the original OD1 & OD2 channels of the original JVM410H alive. Make no mistake these are not the old OD1 channel as you know them in my opinion. It feels as if this previously troublesome area of the amp has been completely reworked. OD1 & OD2 GREEN MODE: Joe says its like the OD1 channel of old with a lot of gain (his words not mine). My words are 'This re-voicing and reworking of these two channels changes this amp in to a workable product - it is reminiscent of a really cranked JCM800 but 'more'. OD1 & OD2 ORANGE MODE: This adds another gain stage to the ‘OD1 Green’ circuit, resulting in a sound that’s perfect for singing leads and hard rock/heavy metal tones. OD1 & OD2 RED MODE: Adds more gain to the ‘OD1 Orange’ for one of the highest gain Marshall sounds around. The effects loop on this amp is different than on the older JVM410H. This one is a serial 'programmable' loop that has a usual return volume type knob on the back of the amp, but what's different is that this control knob can cut or boost the returning signal. In its boost mode it offers up to +6dB gain against a 'flat' return of the older amp. Rather like some of the Mesa Boogie stuff, you can now also use this serial effects loop to completely (they say) silence the amp or indeed to 'boost' the output as a solo/volume boost. Its new on this amp, but nothing new for other manufacturers even going back to the earlier dual rectifier amps from the USA. Its a pity (and not just on this amp) that somehow you could not have 'variable' control over some parameters but alas its not common on amplifiers. The midi implementation is basically like many other amps notwithstanding the earlier model of this amp. There is a midi through socket so you can control other gear, maybe that effects unit with the same foot controller. Like its predecessor there is a direct record out - but that has changed since the old amp had a balanced output connector and this one has a simple jack plug. They say electronically balanced (but the connector changed) as was all the other connectors around the back such as the foot switch plug, the power amp out and return and the mains input. Well lets get one thing out of the way before we proceed. This floor pedal is made in India. Now there's nothing wrong with India if you want some curry. Or maybe an Indian elephant. But somehow I would not particularly equate India as being a capital of the world when it comes to electronics manufacturing. They do have call centres... (yuk) and they do have some really good programmers (yes really) but I don't really want to open this pedal up... so I'll leave it as it arrived. The one I received did not switch anything when I plugged it in and furthermore it would not factory reset. I ended up programming each and every switch individually and that worked. I did mine as above with the exception of no 6 switch which I set to FX Loop on or off. This worked fine once setup in this way for me. And if you have nothing in the loop, depending on the knob on the back of the amp the effects loop could act as a silence or as a booster for lead work (up to +6dB remember). One thing, if you choose channel 2 (say), and have that on the orange mode as you leave that channel to go to a different channel, when you return to channel 2 it will still be in orange mode - its convenient and works great. Its not rocket science to setup and use this pedal and its one of the best features by way of a pedal on ANY regular amp. Of course, if you're like me, you might use a Ground Control from Voodoo Labs to change things. But those cost money and this pedal is included at no extra cost. Nice. I did notice in the manual (especially where Joe Satriani's note were) that he referred to the amp as a JVM410x/JS which seems to infer that this amp will be coming out some time in the future as a combo as well as a head. Maybe I'm wrong on this point and he was merely referring to the Limited rig or to this head... who knows. Well there are a number of people but no one is talking :( so don't hold your breath until the combo appears... it might never appear. Manual: The manual, as most of Marshall manuals is simple and right to the point... the way manuals should be written. Indeed you don't really need the manual except for a couple of silly things like programming that pedal. Overall, a nice manual, but I really don't like how there are no 'Joe Satriani' settings in there - just as there were none for the YJM or the AFD amps. And these amps are supposed to be signature/limited models... ask yourself why they are not in there? I can not think of a single reason can you? I liked the backdrop of amps in the pic inside the manual... but out of the three on display either two were the old amp (maybe) or two of the three had no mid shift button and were early prototypes. It does make you wonder a little. Reading the notes this amp could have almost been a Vintage Modern modified to Joe's requirements. The Amp cover was the staple from Marshall but it did say that it was for this amp printed on it... a nice thing if you like that sort of thing. I don't and will never use it. The YJM cover was exceptional, this one is not. Resonance and Presence controls work on ALL channels regardless of which channel and regardless of how you store the preset. You have them in one setting throughout. Power amp is based on a JCM800 and/or 1959 Super lead... but more pre tubes I guess. The emulated output level is +4dB. The actual weight of this amp is 22Kg which means 48.4 Lbs. in weight... crack there goes my back. But actually its similar to other Marshall stuff. Silent recording through the recording out is achieved in a similar way to other amps - turn on, but keep the amp in standby mode. This way its silent but has an output for recording direct to the desk. Speaker outs are just the same as on the earlier JVM410H - same red connectors and same choices. See, one of those things that put me off this amp was that bad time I had with those other TWO JVM410H heads I had. Its not that this amp head is the same - it absolutely is not. Its just that design... once its in your head and you have had as much aggro as I did on those first two models, well, it makes you think you have got more of the same old thing. But you know what? NOTHING could be further than the truth. The fact is, if you disregard what you think you know about this amp before you buy it then its likely you are going to be in for a bit of a surprise. Nope... its not really much like that older 'other' amp (which I suspect they might even discontinue who knows) and you really have to let you prejudices (if you have any) stand by the side lines on this amp. This IS the amp that the JVM410H should have been all those years ago. "I could talk about this amp all day and how well it's made and the features and benefits of which there are many (a major one being the control pedal supplied with this amp - its a real corker and the JVM410 was the first amp to be introduced that includes this.) But for me, this amp had one flaw - it would NOT drive past about 9:00 on OD1 and OD2 RED channels. And for some time it REALLY bugged me. It's not those great bottom end clunks that this amp can do, or the sparkling cleans that it's also great at. It's not even the plexi style sounds or the newer sounds in there - it's just those pesky OD1 and 2 channels when on RED - indeed they made me see red too!" Bearing in mind what I said above, what's the first thing Marshall did? you got it - they sorted out those abominations called OD1 and OD2 on the original amp. I'm sure Joe would not have used these otherwise. Then there's that issue of the 'choke' which the original amp did not have but many guys added later. Guess what? its on the new amp. Well ticketyboo to all that. Of course there's the other things about the 150Hz mid shift, the redesign or reworking (in my opinion) of the original board. All of those things have added to what was (for me) a mediocre amp (the JVM410H) and effectively delivered a really classic top end amp for which you might well be really glad that Marshall have carried out all this work backed by Joe Satriani. Unfortunately, I have proved conclusively with using this amp that the problem was the original JVM410H - and not just the one I had, because actually I had two of them and they were both as bad as each other. How do I know I found the problem with them? simple. I took the new amp, placed it in exactly the same place in the same room, used the same cab, used the same guitar leads, same settings, used the same guitar and even the same picks and that awful feedback on OD1 & OD2 of the old JVM amp does not exist on this new amp in any shape or form. I can now EASILY crank the drive to 90 to 100% on those channels without any real problem (the old amp managed 20% on OD1 & OD2). This amp was very well made and was on this occasion put together with a lot of care in the build. The sounds of this new amp do not disappoint. Now I'm no Joe Satriani (lord knows) but I could hear some of those 'Joe' tones as I noodled around with the amp for a while. Now then, many people often ask me ' Hey Tony, would you keep this amp (or whatever I was reviewing at the time). Some times I would, and sometimes I would sell faster than you can down a McDonalds. But I hear you ask again would you keep it Tony; well, for me at this time no I would not (I said that at review time but in fact I kept this amp for three years). But that's not for the reasons that you might think. Lets face it, I have a LOT of amps. Of more recent times I've reviewed every top amp Marshall make. Some suit what I do and some don't. I reviewed the AFD100, eventually I grew tired of the treble being excessive and when that channel was 'right' then the other channel was 'wrong' for me. Then there's the YJM100... wow what an amp. That amp has really a great tone. No I don't play Malmsteen (and can't) but its a great amp I still have to this day. But you know what, as great as the JVM410H Joe Satriani amp is (and trust me it is) I already have an amp that can do what this does (at least for me) and that's called a Mesa Road King Mark II. There is little that the JVM Satch amp gives me other than say some noise gates and a 150khz shift and the RK offers lots of stuff that this amp does not (but it should do at Mesa Pricing in the UK). But I can recommend the JVM410HJS Joe Satriani model completely (except for that standby switch - they might be all that way and I've had no problem with it) and Marshall and Santiago Alvarez with Joe have 'fixed' a problem that annoyed me for a long time in the old amp. Both Joe and Santiago should be congratulated on the results between the 'before and after' of this amp. This amp has been truly 'Satchurised' as Joe himself will tell you. But that does not mean it's only good for Satriani sounds... far from it. This is now a very versatile amp that could be used extensively if for example you play in a covers band where you need all those different sounds of amps. They are all in here and easily dialed in no matter what the amp might look like. Its NOT a difficult amp to use although it might look that way to some. So what's your rating for this amp? Actually I liked this amp a lot, and if they had not made the YJM I would have probably kept this one (I did). Overall I think this is worth my rating of 8.5 out of 10 in the points thingy... Its probably influenced a little by the price and my history with the previous model. I think in the USA its way over priced but that's not a reflection on the amp I guess. An 8.5 from me is actually a very good score; most gear could fall well short of that figure; I have actually reviewed gear and given scores as low a s 2 out of 10. Anyway guys, I may well have missed something in this review - it takes a lot to write ANY review, let a lone one for such a premier brand as Marshall. I like to get things right but sometimes miss the odd bit here and there; apologies if that's the case here. Lastly I did play 'surfing' but not as we know it so don't laugh (too much). Actually I don't even know the song well at all, I just sort of made it up as I played so of course its not remotely the same as Joe. Don't worry I'm absolutely no Joe Satriani - he's a fantastic player probably one of the finest in the world right now and I'm not. But probably you're not either - remember most guitarists are not actually the mega gods that some would have you believe they are. Many guys play in the bedroom or similar places and just for fun - like I do these days for the most part. You CAN use this amp anywhere because of the Master Volumes on the amp so it does not really need power reduction or other alternatives on the amp for use in those situations. If you ARE Joe... well at least I tried to play it even if it don't work out too well. But if you want to see more reviews then hop over to my YouTube channel www.youtube.com/tonymckenziecom where you will find over 180 reviews of kit in HD or visit the video page on this site. I want to personally thank you for visiting my website that is completely independent so you can trust the reviews I write whether video or otherwise. These reviews cost me dearly so if you like them say so! Its good to get feedback that is constructive.